Since it's been asked, in both swaps, to allow smaller notebook/journals, I've altered the size/length requirements. Please see changes below, in the Recap section! Here we go on our journal swap, that many have said they wanted. Please read all the instructions! This will be a LONG, time consuming swap. Please only join if you can send this big swap. Inspiration for this swap comes from the ~ Journal of Randomness that @JenL did a few months back. 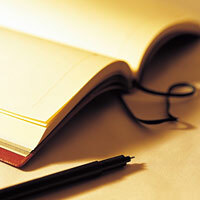 For this journal swap, you will need a full size (8.5x11 or A4) journal or notebook that is at LEAST 70 pages. In the beginning, please include an intro of yourself, as long as you would like to make it. You can treat it like a letter, and tell your partner everything about you, make it good and interesting! After that, there must be at LEAST 50 pages all about books. Please do not make it a 50 page essay on your love of Harry Potter, but include all different kinds of thoughts on a variety of books that you love and reading in general. Some ideas you can use, but are not limited to, are ~ favorite authors, favorite series, favorite books, quotes from books, reading logs, newspaper or short story clippings that you like, your own writings for your partner to read (if you write), where your favorite place to read is, your favorite book store, what you read ("real" books, ereaders), genres you love or hate and so on. If it has to do with books or reading, you can feel free to share your thoughts on it. You may decorate the outside and inside (as long as it doesn't take away from the 50 pages about reading) but it is not required. if you feel like you need to do a smaller notebook, you may do no smaller than 5x7 (A5) but must fill 75 pages about books. This swap will take a while. Please only join up if you have the time to commit to this swap. You will have 12 weeks after sign ups end. I will make separate US and Intl swaps. Please only sign up for one or the other, unless you know you have the time to send both in the same amount of time. Lateness of sending the swap will result in bans from future swaps or removal from the group. Have fun, and enjoy! Any comments, questions, concerns, feel free to message me or leave a comment below. Okay, I'm making a leap of faith with this one as I have been flaked on a couple of journal swaps after working my rear off to make mine nice. But I'm hoping fellow book lovers will be more responsible! Plus, the hostess is a fellow Star Trek fan, so how can this go wrong! I'll try to hold back my Harry Potter enthusiasm ;-) I love a ton of books and genres quite passionately. I'm not worried about filling up the pages with my book-related adventures during my library volunteering shifts, at writer's roundtable, and at BookCrossing meetups. I've got a trip to a Little Free Library planned for August as well. And I'm SUCH a fan of lists. I can't wait to start! Glad to see you ladies joining! Absolutely! As long as it's 50 pages of writings about reading plus whatever you do for an intro. Can it be slightly smaller than 8.5 x 11? I got a very nice, hardback 200+ page journal to use and then read the size. It is about 6x4. I can use more than 50 pages since it is smaller and still have plenty left at the end. See edited swap for size changes. 50 pages front and back or just front? Also, silly me started it in a composition book that is 9.75 in x 7.5 in, 80 sheets. I'll just go with the goal to fill it up.